Airline operator Cathay Pacific has opened a new dedicated yoga area for use by business class passengers at Hong Kong International Airport, China. Located at Cathay Pacific’s Business Class lounge, The Sanctuary by Pure Yoga is a 700ft² (65m²) area divided into two zones – The Body Sanctuary, which is dedicated to yoga, and The Mind Sanctuary, where travelers can meditate to focus and calm the mind. Vivian Lo, general manager customer experience and design, Cathay Pacific, said, “Wellness is becoming increasingly important to our customers and The Sanctuary by Pure Yoga in our Pier Business Class lounge is the perfect place to relax before a flight. We listen to the needs of our customers and continuously evolve to improve their experience with us. Among the wellness offerings, The Body Sanctuary provides travelers with a space for gentle yoga with guided videos led by Pure Yoga teachers. There’s also a secluded space for self-practice. Seated stretching is an alternative option; chairs overlook instructions on how to stretch different parts of the body while seated. The exercises are designed to improve circulation, enhance joint mobility and relax the mind for a comfortable and restful journey. Within the Mind Sanctuary there are two types of meditation on offer. 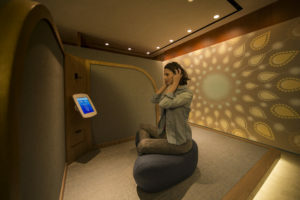 The first is audio meditation: four cushioned pods are equipped with noise-canceling headphones and iPads, and customers can listen to guided meditation sessions narrated by Pure Yoga’s expert teachers. The second is gazing meditation: comfortable cushions overlook graphics placed on the wall ahead and facilitate Trataka yoga practice. These practices help to improve focus, memory and visualization skills, as well as centering the mind in a state of awareness and attention.